Plot: The movie opens to a lakeside hut, where a human Inuyasha (this being the night of the new moon) sits waiting for daybreak as to help Miroku and Sango, whom are chasing Naraku to the lake. Naraku transfroms into a giant spider, crushing the hut just as dawn arrivies. Inuyasha, returned to his demon form, Sango, Miroku, Kagome, and even Shippo take part in the battle, ending in the death of Naraku. 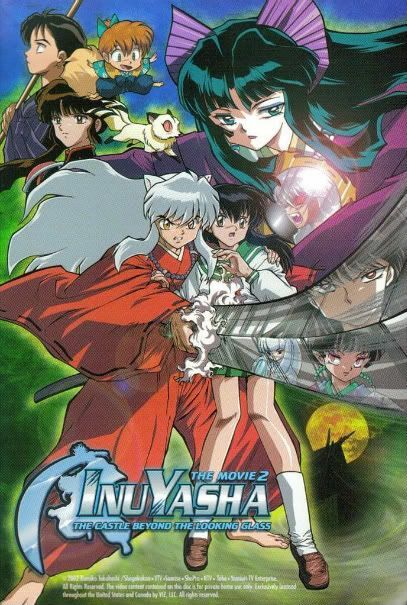 With Naraku defeated, Inuyasha, Kagome, and Shippo part ways with Miroku and Sango to find the remaining Jewel Shards. Sango returns to her village with her brother Kohaku, whom was freed from Naraku. And Miroku journeys to his father and grandfathers graves, as he finally broke the curse of the Wind Tunnel. The calm is soon broken, as a new enemy arises. Kaguya of the moon is freed by Kanna and Kagura, setting out her plan to cover the world in eternal night. Can Inuyasha defeat this new evil, as well as the darkness in his own heart? Has Naraku truely been slain? Find out in "Inuyasha: Castle Beyond the Looking Glass"